Cities Consider Privatizing TSA To Speed Up Checkpoints, But Would It? 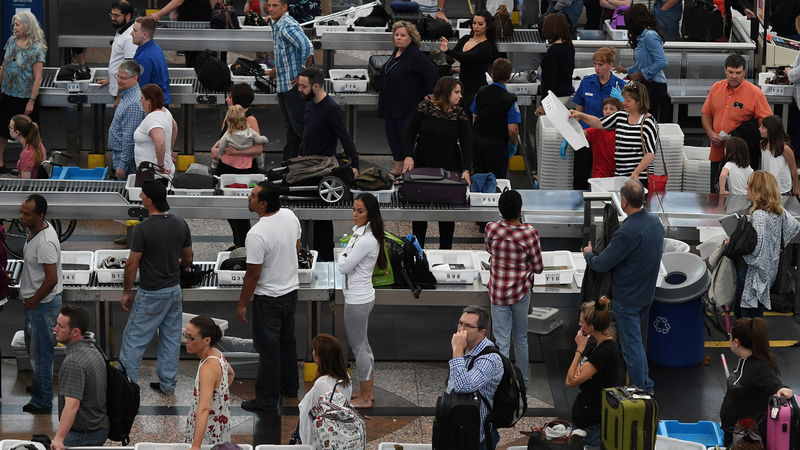 Some experts say replacing the TSA with private airport security firms wouldn't solve the problems causing long wait times and would do little to help this summer's busy travel season. Lines of travelers at Denver International Airport snake their way through security on Thursday. The excruciating wait times at Chicago's O'Hare and Midway airports the past couple of weeks have travelers fuming and some city officials looking for other options. Chicago Alderman Ed Burke is calling on the city to do airport security the way it's done in Kansas City, San Francisco and several smaller airports around the country. He wants to hire a private company to staff the screening checkpoints. "It's working in San Francisco, isn't it? And it's working in 20 other airports around the country. What we do know is it's not working here with TSA, so maybe it's an opportunity to give private industry a chance to show whether or not they can do it right," he says. Officials in New York, Atlanta and other cities are also taking a hard look at whether privatizing airport security might move travelers through checkpoints more quickly. "I look at those lines and just the enormity of that and there has to be a rapid response," says Joe Schwieterman, transportation professor at Chicago's DePaul University. But that didn't happen. Schwieterman says TSA staffing levels are down and budget constraints limit how many new officers can be hired. But he also points out that the long lines have been building for months, reaching a crisis point, because the TSA was too slow to respond. "Private firms can sort of bring something different to the table and respond much quicker. They're not governed by the same bureaucratic rules that TSA is and that would give us a little more freedom to try new things in the future just to make the system work better," he says. All of Canada's airports and most in Europe use private security contractors. In San Francisco, most travelers don't even notice that the security officers there are not TSA employees. They have similar uniforms, equipment and procedures. The head of the TSA, Peter Neffenger, recently told reporters in Chicago that is by design. "Remember that private contractor [is] contracted to the federal government. It still works for TSA; it's still TSA management staff that runs it," he says. "The contractor doesn't work for the airport. It works for TSA, and it has to work at TSA standards and is trained at TSA standards." Neffenger says any airport in the country can apply to privatize its security, and he is open to allowing more to do so. But some experts say there's very little evidence to suggest private airport security is any better. "Privatization doesn't actually solve any of the problems we have," says Bruce Schneier, a security expert with Harvard University's Berkman Center. "The problem with the TSA right now is there aren't enough people for the demand and that's a function of budget. It is not a function of who signs the paychecks of agents — it's how many agents there are." And privatization is no quick fix. Ginger Evans, who oversees Chicago's airports, says getting a private contractor vetted and approved and its staff trained and put in place could take up to two years. "The benefits are very marginal, and there's a huge cost and time associated with the transition," Evans says. "We're not closing the door. We'll evaluate it along with other things for long term, but there are a lot of technology improvements that deserve more focus than that." The TSA is now proving to be a bit more nimble and responsive since the debacle in Chicago last week forced hundreds to miss their flights. A new management team is in place, along with additional staff, so wait times at O'Hare this week average only about 15 minutes. But with airline travel reaching record levels, the TSA warns this still could be a long summer of waiting in security lines. In a previous audio version of this story, we misidentified Harvard University's Berkman Center as the Berman Center.